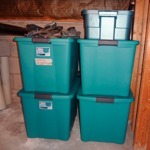 Basement flooding can occur at any time. It can happen to anyone who has a basement, even if it has never flooded before. While most flooding occurs during big rains or rapid snow melts, it can happen even during dry weather. Everyone in the community plays a role in helping to prevent basement flooding. If we all take preventative measures, we can make a significant impact in reducing flooding throughout the City. Related article: Know your Flood Facts: reduce the excess water that contributes to basement flooding. All basements are at risk. If you have a basement, you’re at risk of basement flooding, even if it’s never flooded before. We suggest that you do not store any valuable property in your basement, but if you do, take measures to protect them from flooding. Your actions affect your entire neighbourhood. Changes to a home’s plumbing or lot drainage can help reduce the chance of flooding whether its your own home or your neighbours’. It takes the entire community working together to make a positive impact on flooding. One person may be “just a drop in the bucket”, but collectively we can make a big difference. 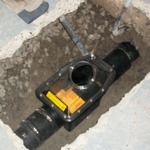 Regularly maintain your sewer lateral. The sewer later should be regularly maintained. Talk to a licensed plumber, who can carry out an assessment. 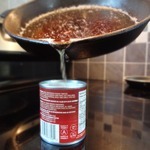 Dispose of cooking fats, oils, and greases in your Green Bin, not your drain. Never dispose of fats, oils, or greases down the drain or toilet. Poor cooled cooking fat into a paper cup. When it has solidified, transfer it to your Green Bin. Replace the tin can shown at left with a paper cup. Tin cans cannot go in the Green Bin. Speak directly to your insurer to find out if your policy protects you against sewage backups and water damage. Understand how your drainage and plumbing works. Learn what danger signs to look for and how to maintain your home’s drainage and plumbing. Talk to your plumber or your home inspector. Sump pumps can keep your basement dry. 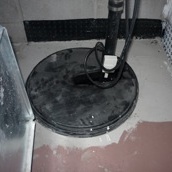 Installing or upgrading your sump pump may help prevent basement flooding in your home. Also, consider providing a backup power source for your sump pump. If you have a sump pump, make sure that it drains only onto your lawn or into the storm sewer. Sump pumps that connect directly to the sanitary sewer are illegal, by City By-law No. 2008-192. This sort of a connection puts you and your neighbour’s properties at risk. Reduce your water use on rainy days. When it’s raining heavily the sewers may fill up. Using a lot of water during heavy rains (for example, taking a shower or doing laundry) can contribute to basement flooding and overflows to your environment. Consider using less water in extreme weather situations. Check all of your downspouts. Properly connected downspouts reduce flooding in your neighbourhood. 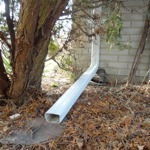 In most cases, the downspout should be draining over top of the lawn, at least two metres away from your house. 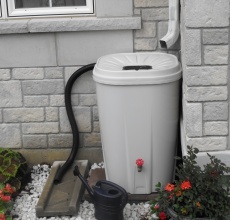 There are many natural ways to manage run-off on your property, including rain barrels, conservation gardens, proper sloping, and so on. Lot grading can help move water away from your home. The chance of a basement flood increases when more groundwater sits around your foundation. Keeping the ground surface sloped away from your home is one way to reduce the water around the foundation. 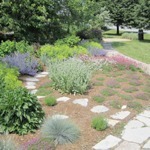 Consider redoing the landscaping around your house as it may settle over time. Inspect your property when it rains. Walk around your property when it rains to find the places where water may be getting into your home or where pooling water needs to be managed. One common way for water to get into your basement is through cracks that may form as your home ages and settles. Maintain your foundation by sealing any cracks that may have formed and consider waterproofing the exterior walls. Keep your eavestroughs and downspouts clear of debris. Eavestroughs and downspouts that are clear of leaves and other debris are an essential part of helping rain water run safely away from your home and off of your property. Install a backwater sanitary valve. Installing and maintaining a backwater sanitary valve can help prevent basement flooding in your home. Follow the manufacturer’s recommendations for the type and frequency of maintenance. 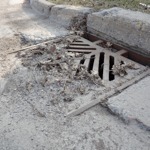 Keeping catch basins clear of debris will help prevent local flooding. If you see one that’s blocked with leaves or debris, we’d appreciate it if you could take a few moments to remove the blockage. Know the City of Kingston By-law No. 2008-192 - “The Sewer By-law”. By-law 2008-192 is intended to help protect properties from flooding. Understanding and following the by-law is everyone’s responsibility. More information on this by-law, including about fines and enforcement, is available as a PDF document from the City of Kingston web site. Knowing where basement floods are happening helps us plan investigations and potential improvements to the City’s infrastructure. We’re also interested in hearing about historical flooding. Use our on-line Basement Flood Report, or call us at 613-546-0000 to tell us about your basement flooding incidents. We are offering financial assistance programs to help property owners install preventative plumbing measures, such as a sump pump or a backwater sanitary valve. Apply online, it only takes a few minues! Application forms are also available at City Hall or by calling customer service at 613-546-0000. Learn more from our Preventative Plumbing Program page. To learn more about the projects Utilities Kingston are working on to address the problem of basement flooding, or if you have questions or concerns, contact us at info@utilitieskingston.com. Also, watch for further information from Utilities Kingston in the local media.